Three of the relatively small number of hiking trails in Mesa Verde National Park start in the north near Morfield campground; 4 miles from the entrance; the long (7.8 miles) Prater Ridge Trail that loops around a high escarpment, and two much shorter hikes to viewpoints - the Point Lookout Trail and the one mile Knife Edge Trail, which climbs gently through a low pass then continues along the side of a steeply-sloping ridge, overlooking extensive lowlands to the northwest, across to Sleeping Ute Mountain and (on a clear day) the Abajo Mountains in Utah. The pass follows a narrow, disused roadbed (built in 1914), once part of the main route into the park prior to construction of a tunnel to the south, through a ridge between Prater and Morfield canyons. The downhill half of the old road is closed to hiking because of the danger of rockfalls, though the lower end can be seen beside the current road, at Montezuma Valley Overlook; a little path extends about 200 feet before a warning notice tells people not to proceed further. Although short, the Knife Edge Trail passes a variety of scenery, and plant life - an illustrated guide is available that lists 32 species viewable along the way, not just the usual trees and bushes but also over a dozen types of wildflowers. 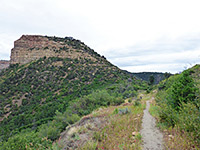 Part of the trail crosses grey slopes of Mancos shale, which although generally unvegetated, is home to a few relatively unusual species including Hayden's gilia and adonis blazingstar. The trailhead for the hike is at a perhaps unnecessarily large parking lot along Morfield Campground Road, just past the main camp and shortly before the end of the road at the amphitheater. The path seems not to receive many visitors and is likely used mostly by people staying at the camp, who walk from there rather than use the parking area. The path is straight at first, and quite wide, with a gravel surface. A connection to the Prater Ridge Trail forks off to the left, crossing a patch of grassland, while to the right the land rises steeply, up to the isolated, flat topped summit of Lone Cone. Past here, after rising gently to a saddle, the ground starts to slope down, and the land falls away much more sharply to the east so the views become quickly more extensive. 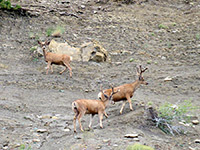 The surrounding grass and scattered sagebrush are replaced by denser vegetation including gambel oak and pinyon pine trees, mixed with big light brown boulders of Point Lookout Sandstone. The path moves over a relatively barren expanse of the shale, where the ground is muddy and slippery if wet, then re-enters more overgrown terrain, followed by more shale, as the route descends a bit more and ends at a rocky viewpoint. A notice against continuing, because of the rockfall danger, though the course of the old road is hardly evident and the slopes ahead look no different to those behind - both are covered with plenty of large, fallen boulders.